Creating an online course and ultimately a stream of “passive” income is what a lot of online entrepreneurs are striving for these days. Sharing your knowledge with a tribe of people that you can help AND make money in the process. Well, it ain’t exactly that easy. The truth is, there’s a ton of work involved in the creation, launch and maintenance of a membership site, so I’m going to share all the good, the bad and the ugly with you. This is part one of a two part video blog series where I’m going to break down for you what I did to launch it the first time, how I grew my tribe the second time and what’s in store for the future of Craft to Camera. In the process of building my own online course, and working with clients who are doing the same. I’ve seen all different approaches. Depending on your niche and industry, there’s no right or wrong way to build and launch, but there are certainly some key concepts that you need to be thinking about that will help you to position and plan your course that has a direct relationship with how well it sells. Let’s dive in, shall we? When I first started my business, I slowly started list building with video blogs. I had no idea about running Facebook ads, or really using Facebook as a marketing strategy. But I knew there was a demand for learning more about videos to help grow your business. So I narrowed down 4 modules of creating a business video from start to finish that would be my free opt-in. I created (what I thought to be) a killer opt-in video with animated text and shared it everywhere, but with very little traction because no one knew who I was. BUT I knew the content was going to be really good, so I kept pushing forward. Eventually, with the help of a few people who had really connected with my vlog content, these people helped to share this free training, my mini tribe started to grow. And when I say mini, I mean mini. I think I had less than 40 people join this free training at the time. But that was okay. I remember jumping for joy when I had 5 people join my list at once. And mind you, at this point, I had ZERO intentions of creating an online course, I was just focused on list building (which, and should always come before building your online course, even with small numbers, but I’ll dive more into this in just a bit). I set a launch date to begin releasing these 4 weekly modules of free online video training that would only be available for a limited time, and began to write, shoot, edit and share module 1. Every week, I would release a new module. I crafted the best content I knew how at the time because I knew how important a killer opt in was. And it showed, because even though my tribe was mini, they were engaged. They would email me back with replies and comments about the module, which totally inspired me and made me realize that helping others with videos was totally going to be my path. So, I started my Facebook group, Craft to Camera. Now, here’s something else you should know. Not everyone who joins your list is going to join your group, and vice versa. So when I first started this group, I had maybe 16 people in the group (with half of them being friends and family), BUT we all ran in the same Facebook communities, they all really knew who I was, and they were happy to help share my content. So, what’s the lesson here? Even if you’re starting with a small list, you MUST have engagement with your group. This is essential for getting a feel for how others receive your content, and where any gaps might be that we just can’t see ourselves because we created it. This is also what will help to guide you in the course creation process. With so much great feedback, it dawned on me that this could be the beginning of an online course. So, I sent a survey to my group and asked them whether they would be interested in a paid membership to learn more, specific topics from highest importance to lowest importance, how much they were willing to pay, and even their preferred schedule for the upcoming training. I didn’t know if people wanted to dive into the content, or have their Christmas break. Whether speaking on camera was more important that editing. These are all things you have to ask and never assume. Now, you don’t have to live and die by their answers, but it will give you a gauge of what the demand is for your content, as well as the urgency. As we know, when there is urgency, the cost is higher, and people are more likely to convert into buyers. If what you’re offering is helpful, but it’s not something that people actually NEED, you’ll have to tweak your offering or position it differently to create a higher demand. With my survey responses back and a Christmas holiday approaching, I started to map out 8 modules of video training which would evolve to be Craft to Camera, and how I could re-structure my current content into new content. But I hit a few problems. A) Delivery of this program meant that I needed a platform to deliver it which would take time and money to design and create. B) Now that I had given 4 modules away for free, I couldn’t expect people to pay full price (which, is a lesson I still had yet to learn in the second launch, but more about that later). My first launch went something like this: create a sales page based on the survey feedback and I had received, then send newsletter to my list of 60 people saying something like, “if you’ve been along for this free training so far, and liked the content, then I would love for you to join Craft to Camera. I’m going to build an online platform to which you’ll have lifetime access to, and being my beta launch, you’ll actually help me to build the content too. Who’s in?? !” And linked a paypal button to the sales page. I was just learning all the tech at this point and honestly, when I launched the page, I didn’t even know if the button worked. But I had already wrestled with it all night, and I truly had no expectations as to who would purchase the program. I just released it into the world and allowed it to unravel on it’s own, and my actions would follow. PERCEIVED VALUE VS PRICE TAG. I remember sending my newsletter the sales page then immediately having to drive from Vancouver, BC to Portland, OR to spend time with my then boyfriend. It was actually a good thing that I had to hit the road so I could take my mind off of this launch. Mind you, I would never do this again for a launch to my current list, but at the time, my mode was small, slow and steady. So I was cruising down the I5 and realizing that I was low on gas, so I pulled over to a gas station and in the meantime, checked my email and saw my first ever Paypal purchase come through. I literally instantly started to bawl my eyes out as I was just so overcome with gratitude that someone believed in me, and my content, and I knew that this would be a new leg in my online adventure. Then I had to explain to my boyfriend why my eyes were so red and puffy when I saw him. Over the next week while carts were opened, I saw a conversion rate of 15% from my mini list of 60 people. Not bad. From this list, everyone was an engaged member of my newsletter community who had already followed my vlogs, or was chatting with me in my Facebook group. I did, however, have one random from a black Friday sale. I believe this is because of the value proposition of what I would be sharing over 8 modules of this program, and all the content that I had already created for free, and the super low price point of $197 to be a beta member with Lifetime Access. I made it a no brainer to join .. and that’s exactly what you should be aiming for too. No matter what you’re offering, think of it from your prospective buyer’s perspective. Aside from the pretty bells and whistles, your course must fill a need and pose a value that’s higher than the asking price. YOUR CURRENT MEMBERS WILL HELP YOUR FUTURE SUCCESS IF YOU TREAT THEM RIGHT! In my beta run, it was super important to me that I had the feedback from the members at every step of the way. I held weekly Google Hangouts which were essentially webinars that dove even deeper into that week’s content with room for Q&A. Sometimes, there were only 2 or 3 people that joined, and to be completely honest, creating weekly webinar content while creating the course content was EXTREMELY draining. By the end of the first live run, I was so exhausted I couldn’t even drink a glass of wine to celebrate. I just wanted to sleep for a week. BUT, I’m also so glad that I had put forth the energy to facilitate my member’s learning. Because we had been interacting (virtually one on one) for more than the last 8 weeks, members were happy to provide testimonials and even video testimonials, which I knew would be super important in launching a new course. Why should anyone pay money to learn with me? Because I’m committed to seeing members get results that’s why. And here are the testimonials to prove it. 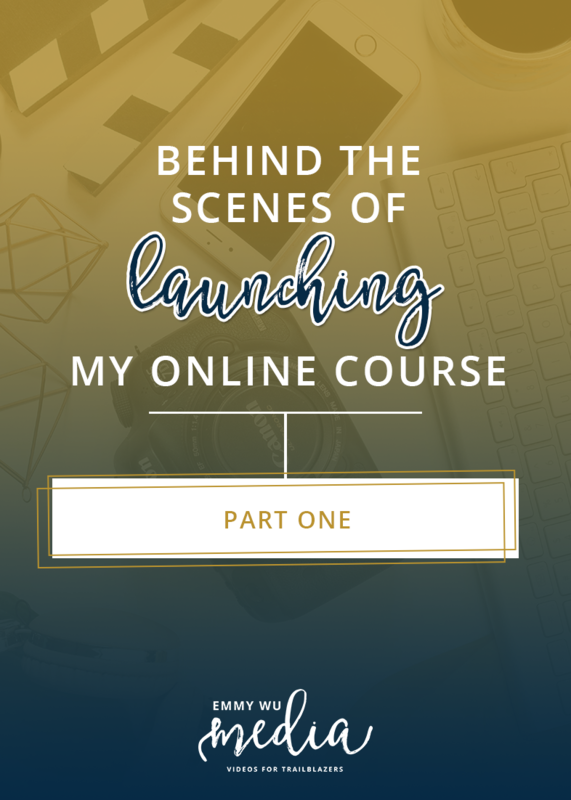 So how did the first beta run evolve into a full-blown video bootcamp that would grow my Craft to Camera list from 80 people to over 600 and doubled my Facebook group in less than 3 weeks? I’ll share all that with you in the next vlog. I’ll also tell you how the second launch was dramatically different, how I had to totally pull a ninja move to make this new launch successful, AND the (exciting!) future of Craft to Camera. See you in the next video! Awesome stuff, Emmy – thank you so much for sharing the story of your ongoing adventure! !